(about 40,000km² ) where the only arable agricultural land is found. Large areas of land form part of the Sahara Desert and are lightly inhabited. Around half of Egypt's inhabitants live in urban areas, with the majority spread across the densely populated centers of greater Cairo), Alexandria and other major towns in the Nile Delta. 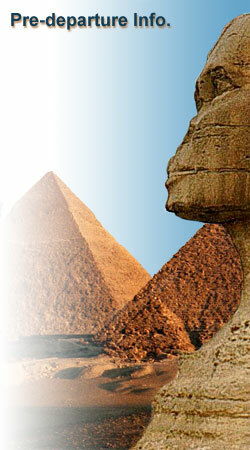 Today, Egypt is widely regarded as a main political and cultural centre of the Middle East. GMT + 2 (GMT + 3 from last Friday in April to last Thursday in September). According to the 1986 census, over 94 per cent of the population follows Islam; the majority of the rest is Christian. All types of Christianity are represented, especially the Coptic Christian Church. There is also a small Jewish minority. Most areas 220 volts AC, 50Hz. Certain rural parts still use 110 to 380 volts AC. (c) cruise ship passengers entering Egypt, at any port, for a maximum of three days. Egyptian Pound (EGP; symbol E£) = 100 piastres. Notes are in denominations of E£100, 50, 20, 10, 5, 1, 50 piastres and 25 piastres. Coins are in denominations of 20, 10 and 5 piastres. Available at banks, official bureaux de change and most hotels. Banks often have better exchange rates than bureaux de change or hotels. All common international currencies are accepted. American Express, Diners Club, MasterCard and Visa are accepted, but generally only in bigger hotels or restaurants in Cairo and restaurants in tourist areas. To avoid additional exchange rate charges, travelers are advised to take traveller's cheques in US Dollars, Euros or Pounds Sterling. The import and export of foreign currency is unlimited. The import of local currency is unlimited. The export of local currency is prohibited. Jan 7 2006* Coptic Christmas Day. Jan 10 Grand Feast. Jan 31 Islamic New Year. Apr 23 Sham el-Nassim (Coptic Easter). Apr 25 Sinai Liberation Day (Sinai only). May 1 Labour Day. Jun 18 Liberation Day. Jul 23 Revolution Day. Aug 15 Wafa'a el Nil (Flooding of the Nile). Sept 11* Coptic New Year. Oct 6 Armed Forces Day. Oct 22 Bairam Feast (End of Ramadan). Oct 24 suez Victory Day. Dec 23 Victory Day. Dec 31 Grand Feast. Jan 7 2007* Coptic Christmas Day. Jan 20 Islamic New Year. Apr 8 Sham el-Nassim (Coptic Easter). Apr 25 Sinai Liberation Day (Sinai only). May 1 Labour Day. Jun 18 Liberation Day. (a) These holidays are not official, although Coptic Christians may observe them. (b) Muslim festivals are timed according to local sightings of various phases of the moon and the dates given above are approximations. During the lunar month of Ramadan that precedes the Bairam Feast, Muslims fast during the day and feast at night and normal business patterns may be interrupted. Some restaurants are closed during the day but most tourist attractions and hotels are not affected. Some disruption may continue into the three-day Grand Feast itself. No immunizations are required or needed Unless stated by the ministry of Health . Egyptian cuisine is excellent, combining many of the best traditions of Middle Eastern cooking, and there are both large hotel restaurants and smaller specialist ones throughout the main towns. Some of the larger hotels in Cairo and its environs have kitchens serving top quality cosmopolitan dishes. In the centre of Cairo, American-style snack bars are also spreading. Restaurants have waiter service. Although Egypt is a Muslim country, alcohol is available in cafe-style bars and good restaurants. The legal drinking age is 21. Remember to drink considerable amounts of water to avoid dehydration during the summer , Make sure that all the food you eat is cooked well & your fruits & Vegetables are Peeled if you are going to Eat it uncooked. Tipping: 10 to 12 per cent is added to hotel and restaurant bills but an extra tip of 5 per cent is normal. Taxi drivers generally expect 10 per cent. The most interesting shopping area for tourists in Cairo is the old bazaar, Khan-el-Khalili, There are also modern shopping centres available, particularly . Haggling is expected, and sometimes encouraged, as a way of communication and human contact. Egypt has year-round sun, and almost no rain except in Alexandria, which has a more Mediterranean climate than the rest of the country. Daytime temperatures range from pleasantly warm in the winter to very hot in the summer. Northerly cities such as Cairo and Alexandria are generally about 5ºC cooler than southerly areas such as Aswan and Abu Simbel. Nights in the desert can be extremely cold. Very good, comfortable walking shoes: You will be doing a considerable amount of walking, and shoes should not be just comfortable, but comfortable to walk long distances. Hats and other covering: Large brimmed hats that provide not only a head covering but also a certain amount of shade will come in very handy in the hot Egyptian sun during summer. In addition, scarves or other apparel should be taken along to cover shoulders and arms, and again, or not only important for visiting religious sites, but also to keep the sun off during treks. In very hot weather, a cloth hat or scarf that can be soaked will also help keep your head cool. Sun block: While sun blocks may be purchased in Egypt, you might prefer to bring your own favorite brand. Sunglasses: Another item that may be necessary to avoid the direct sun rays coming direct into your eyes. If you wear prescription glasses, bring an extra pair or at least a copy of the prescription. If you wear contact lenses you may wish to bring a pair of glasses along, as the fine sand dust in the air in Egypt may irritate your lenses. Also useful are cool wipes and moisturizing creams to protect your face from the hot, dry climate. Of course, bring your prescription medicine. There is no problem with bringing prescription medication into Egypt. It is also more convenient to bring your favorite non-prescription medications along. Power Adapters come in two different varieties. Some electronic equipment have switches to allow you to change the power input type. For these, a simple wall adapter is all that is required. However, other electronic devices do not have such switches and in this case, you not only need a wall adapter, but also a power converter. Egypt uses 220 volt and plugs are two prong rounded. An Extra Bag: A bag, preferably soft, which can be crunched up and carried into Egypt in another bag will be handy for most people. The bag will then be used to carry back souvenirs. Beware: Egypt Air has been strictly enforcing excess baggage charges. To avoid these charges, you should travel on domestic flights with less than 20 kilos of checked baggage. You can deposit some of your excess luggage at the hotel for your second stay. Our representative will be happy to organize that for you.